Genetic testing may seem simple on the surface. Order a test. If it’s positive, the dog will have symptoms. If it’s negative, there is no risk for the disease. Open and shut. However, there are many molecular details that can make genetic testing extremely complicated. Today’s topic is reviewing these facts and how they impact the diagnosis of a genetic condition and the chance it may happen again. My goal isn’t to bestow upon you an honorary degree in genetics, but to help you understand how these diseases are diagnosed and how genetic testing for those diseases is designed and interpreted. Although genetic testing is expanding at an extremely fast pace, it is not perfect. Genetic testing can allow you eliminate certain conditions but, unfortunately, nobody has a crystal ball and can therefore, not exclude all possible diseases in any dog. Genetic tests are designed after a mutation causing a disease has been described in the medical literature. It may be a mutation common in a particular breed or it may be very rare. In addition, it may not be the only mutation in that gene, or there may be other genes, that cause the same disease. In humans, it is often the case that a genetic disorder has 20 common mutations, but there can be over 100 mutations documented for that same disorder. The 20 mutations may be seen in 90% of those affected with the genetic condition and if a test is designed to detect these 20 mutations, then the test has a good detection rate (90%), but there is still a small chance that someone who tests negative will still be a carrier or even have the disease. As technology gets more affordable, it becomes more cost effective to add mutations to the panel for a particular disease. With each new mutation that is added, detection rates may only increase slightly because each mutation is rare among those with the disease. For example, adding 30 more mutations to our imaginary genetic test may only increase the detection rate by 1 or 2%. Because of the way the various dog breeds have been created and kept isolated from other breeds, most diseases that occur within a breed are caused by one or maybe two different mutations. However, the same disease that is found in more than one breed may be caused by different mutations in those breeds that are affected. The progressive retinal atrophies (PRAs) are examples of this. There are PRAs, such as PRA-prcd in which the mutation is found in many breeds and PRA-crd found in dachshunds. Therefore, another fact that can make genetic testing not as simple as we would like is that there are some diseases caused by multiple genes. How is this possible? Genes are the instructions our bodies need to produce proteins. These proteins work together to do a specific job (coat color, muscle development, food digestion, etc.). No gene (or protein) is an island. Many gene products (proteins) are interconnected in a pathway (sometimes several pathways) to perform their specific duty. Within the entire canine population, mutations in different genes in the same pathway can cause the same disease or symptoms. In human genetics, multiple gene panels are being developed to test for many mutations in many different genes that cause the same or similar disease. This increases the accuracy of a test even more because you increase the chance of finding the causative mutation. This concept can be applied to canine genetics as well. 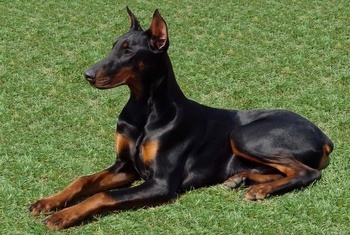 For example, let’s look a little more closely at the genetic test for dilated cardiomyopathy (DCM), which is a heart condition that affects many breeds of dogs, but is best known in the Doberman Pinscher. Symptoms include the enlargement of the heart chambers and the muscles that divide up 4-chambered heart can stretch out to become thinner than they are supposed to be. Eventually, this can cause heart failure. Genetic testing has only recently become available for DCM. There is a single mutation in one gene (PDK4) known to cause DCM that has been identified…so far. However, there are likely other mutations within that gene, or another gene(s) that cause DCM that are yet to be discovered. This situation has confused breeders as some think that the current DCM test is not accurate. The test is extremely accurate in identifying the mutation in the PDK4 gene when present. However, because of incomplete penetrance, some dogs that have the mutation will not show the disease. In addition, some dogs will test negative for the known mutation in the PDK4 gene, yet will develop DCM. This is because they likely have either a different mutation in this gene or a mutation in another gene that causes the disease. As we learn more about the genetics of DCM, genetic testing will only improve. So, given what we’ve learned, it is entirely possible a Doberman could test negative for DCM, but still develop DCM leading to heart failure. Understanding the way genetic tests are designed, testing for more than one mutation and testing as many genes as available, will allow the breeder/owner to understand the risk for these disease in a dog, even with a negative genetic test result. Maybe I was wrong…perhaps you have earned your honorary degree in genetics! I trust this information is helpful to you, and will be used to better understand and care for dogs at risk for, or affected by, inherited canine genetic conditions.